The main reason for our excursion to the far north was to activate the special call, VK100ANZAC, at the Farina historic village near Farina Station. Farina Station is a pastoral property just off the road which travels from Lyndhurst to Maree. Farina really looked good, especially the camp ground near the creek. 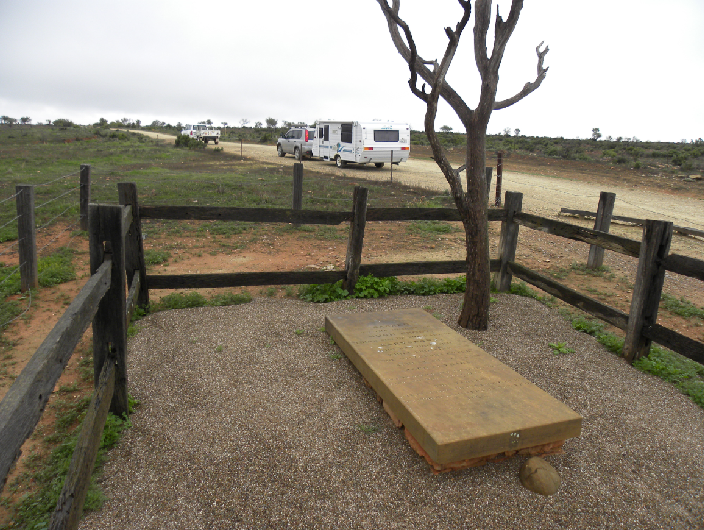 We have been to Farina a few times in the past and the camp ground has been a dusty bare area – but not this time. While waiting for advice about road closures at Parachilna we met up with John, VK2KYO and his wife Sue. John and Sue camped at the Beltana race track parking area where we and David and Joy camped while waiting for the road to open at Warriota Creek, the barrier to getting to Farina. At Farina we camped in a small group with John and Sue. 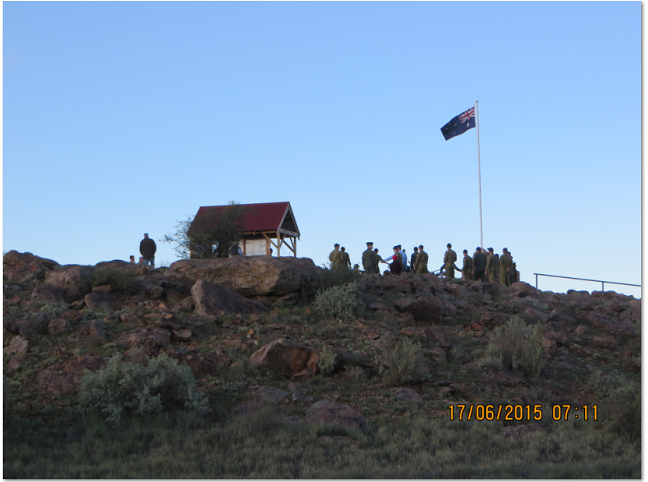 We arrived at Farina on Wednesday afternoon in time to set up camp, activate VK100ANZAC and then attend the ceremony at the new memorial recognising the number of persons from Farina who contributed to Australia’s war effort in both the First and Second World Wars. The is a memorial which lists the name of all of these persons. 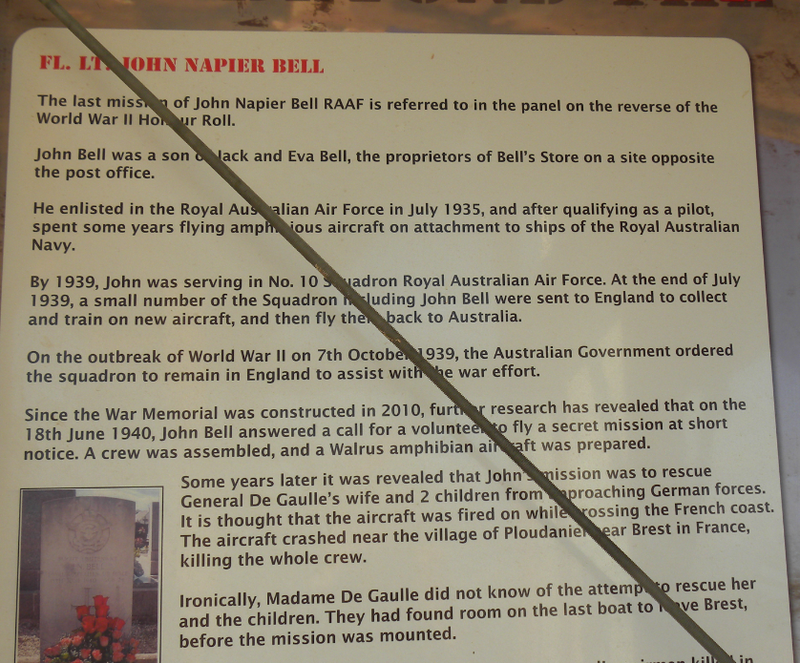 Of special interest to us was the life of Flight Lieutenant John Bell. You can read all about this man from the Farina Restoration Group’s home page. 10.130 00:06Z, VK5ZK, Garry; VK5TW, Trevor; VK5HS, Ivan; VK5KLD, Les; VK5ZK, Garry; VK5JK, Jeff; VK5RM, Phil; 7.095 00:55Z, VK5FANA, Adrian; VK5PAS/P, Paul; VK5HS, Ivan; VK5KLV, Les; VK5FANA, Adrian; VK2GKA, Karl; VK5NQP, David; VK5IS, Ian; VK5MBD, Bill; VK5FCLK, Chubba; VK5GY/M, Gordon; VK5HS, Ivan; VK2ALH, Ross; VK5VGC, Grant; 10.130 04:35Z, VK3KYF, Garry; VK6WE, Wes; VK5TR, Jim; VK2IX, David; 7.095 23:08 VK5BC and 23:57 VK5PAS/P5 (VKFF-189). All VK100ANZAC logs will be consolidated in due course. 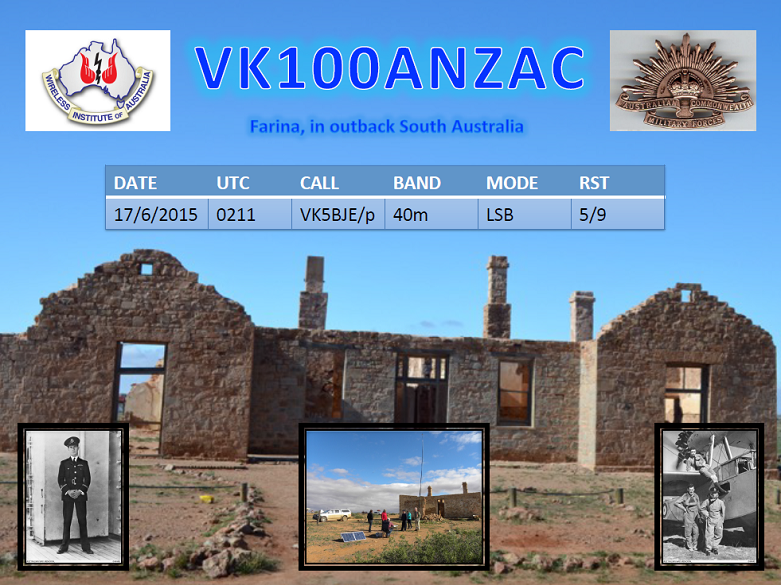 I was pleased to work VK100ANZAC with Paul on the microphone using my own call-sign and thus gain this special qsl card. Our Farina Odyssey had everything you need for an adventure: rain, mud, dust, wind, cold, adventure, Peaks, Parks and amateur radio, but most of all good company. Our team in included VK5PAS, Paul and Marija, VK5KC, David and Joy and my wife Jenny. 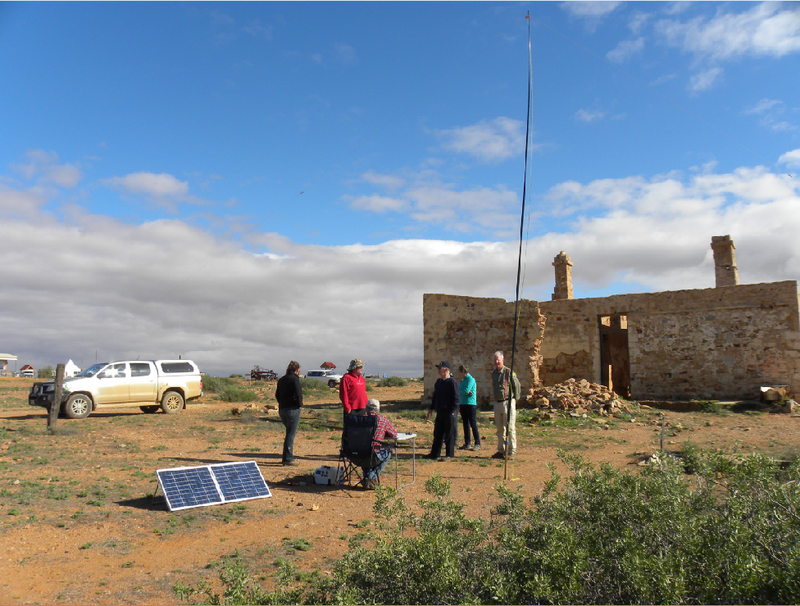 Our major aim was to share in the commemorations at Farina historic village in the far North of South Australia, especially through the operation of our amateur radio station using the special call VK100ANZAC. We left home on Thursday 11th June and stayed the night at Port Pirie. My first activation was on Friday morning. We visited Mount Remarkable National Park, VKFF-360. We re-visited Mambray Creek where we have previously camped. I set up in the day visitor area and secured 12 contacts. 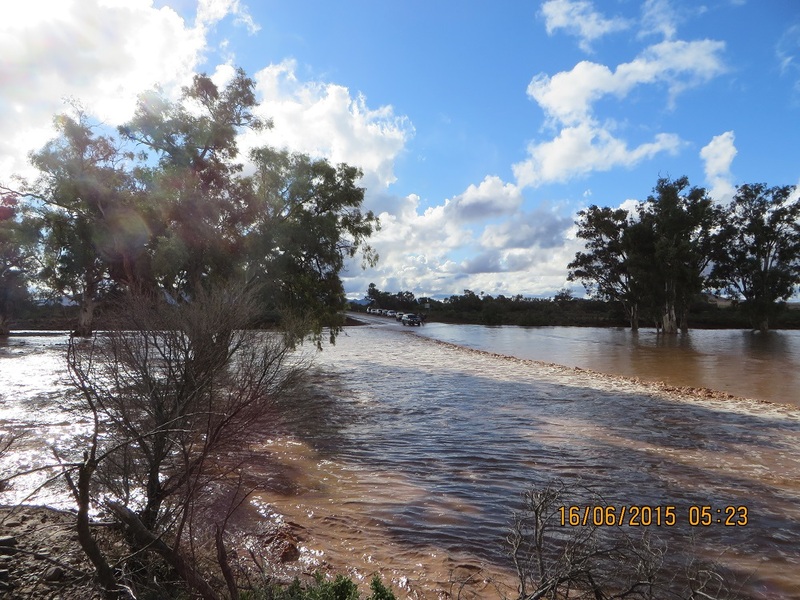 After Friday evening at Port Augusta we caught up with the team and drove to the Argadells. On our way to the Argadells we lunched at Warren Gorge. A school group was on an adventure camp and the second photo shows some of the pupils testing out some of their rock climbing skills! I sought and obtained approval from the teacher-in-charge to take the photos. I also showed her what I had taken and indicated that the photo/s may be shown on my blog. She was very interested in amateur radio. The photo of our 4×4 and trailer were also taken here. The Argadells is a magnificent property where Mount Arden, VK5/NE-034, is located. We stayed at the Argadells for three nights and this became our base for other activations. Unfortunately, we could not access Mount Arden because of the rain and this objective had to wait until Monday morning 22nd June. I made ten contacts. 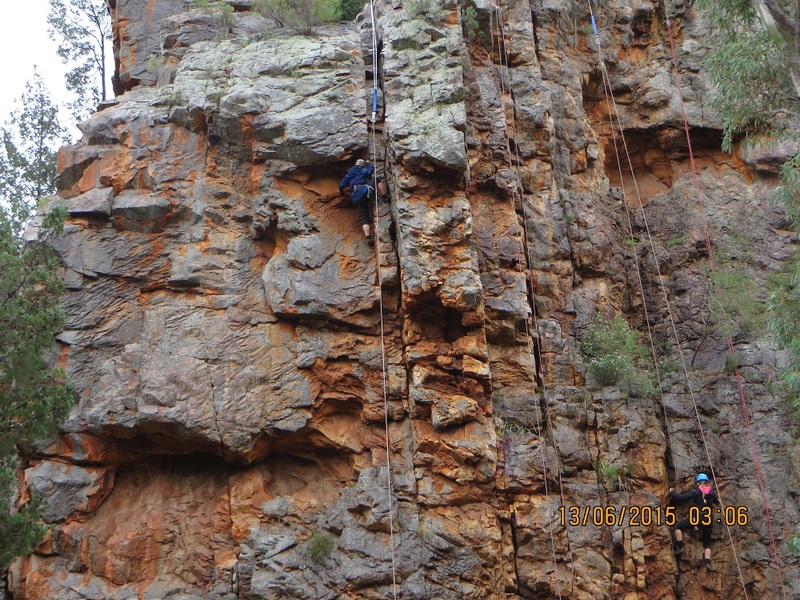 While at the Argadells on 15th June we travelled to Devils Peak, VK5/NE-080. Twelve contacts were made including one on six metres ssb with VK5CZ, Ian. After lunch we moved on to Mount Brown Conservation Park, where I enjoyed 23 contacts. 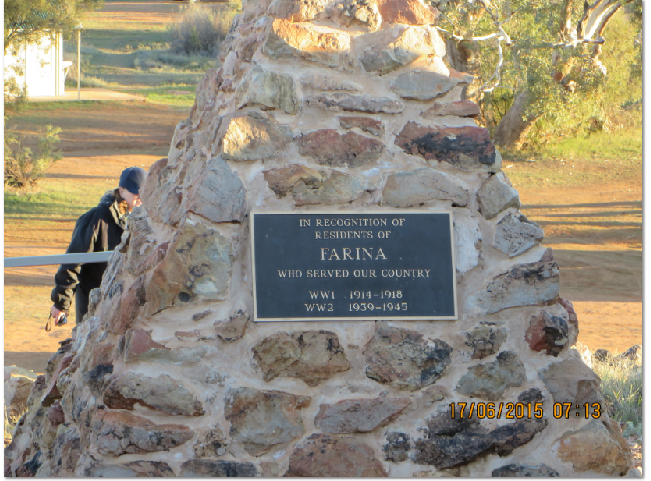 The next day was set aside for travel to Leigh Creek for shopping, fuel and laundry and making our way to Farina. However, the heavy rain made a change of plans a necessity and we camped off the road at Beltana because of an impassable creek crossing. After leaving the Argadells we travelled to the Hawker Road taking a short cut rather than returning to Quorn to take the main road. The gravel roads were in generally good condition. There were, however, a few slippery spots and a crossing of the Willochra Creek. Just before reaching the creek we stopped at Hugh Proby’s grave. Hugh Proby, a pastoralist, lost his life in 1852 by drowning in the Willochra Creek. This followed a thunder storm and a response to cattle that had scattered in the storm. He tried to swim his horse across the creek and was swept away. Hugh Proby was the third son of the Earl of Carysfort. His grave stone was shipped out from the United Kingdom a few years later and hauled to the present location on Arden Vale Road. The photo shows his grave and David’s vehicle in the foreground and mine in the background. 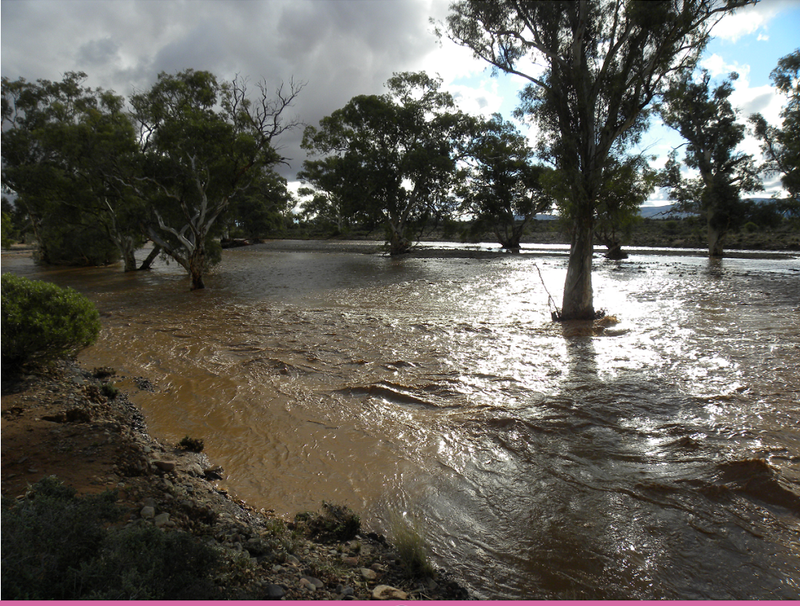 Here are two useful references if you choose to visit the Flinders Ranges and surrounding areas in South Australia. Neal, L., 1987, An Earl’s Son: the Letters of Hugh Proby, Adelaide, self -published. Nicol, S., 1998, Flinders Ranges and Mid North, Adelaide, RAA Touring. We arrived at Farina on Wednesday afternoon 16th June. 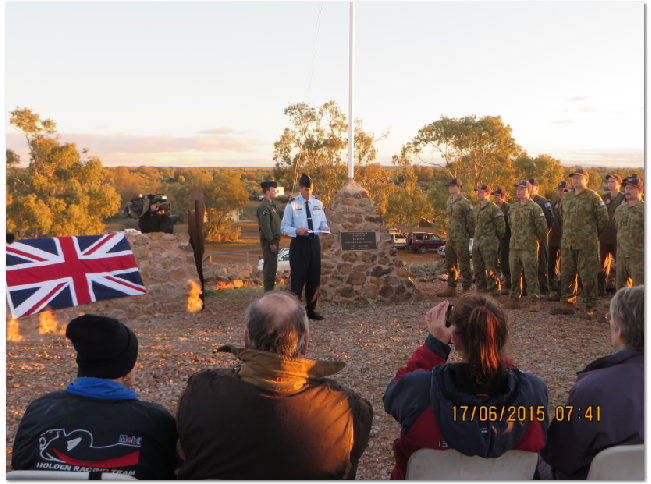 We attended the commemoration service at 17:15 hours central Australian time as well as beginning our activation on VK100ANZAC. Thirty-two contacts were made by me using the VK100ANZAC call. 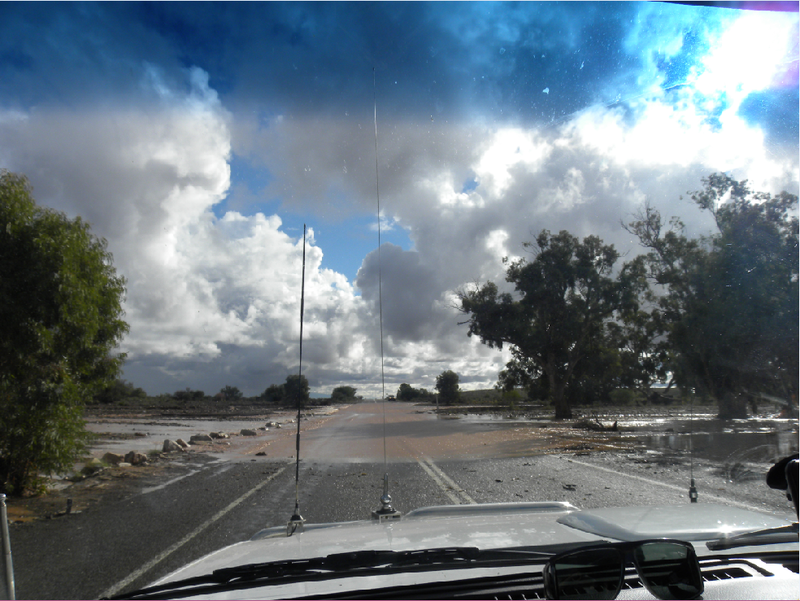 On Friday 18th June we left Farina to travel to Merna Mora station, a pastoral property just North West of Quorn. This was our base for further activations. 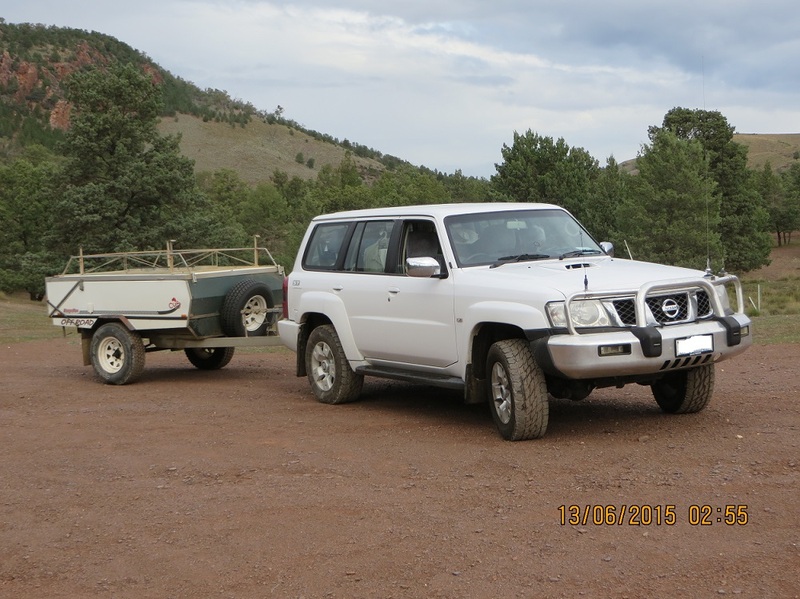 On the 19th June VK5PAS/P5, Paul and I activated Mount Scott, VK5/NE-111. Twenty-two contacts were made. 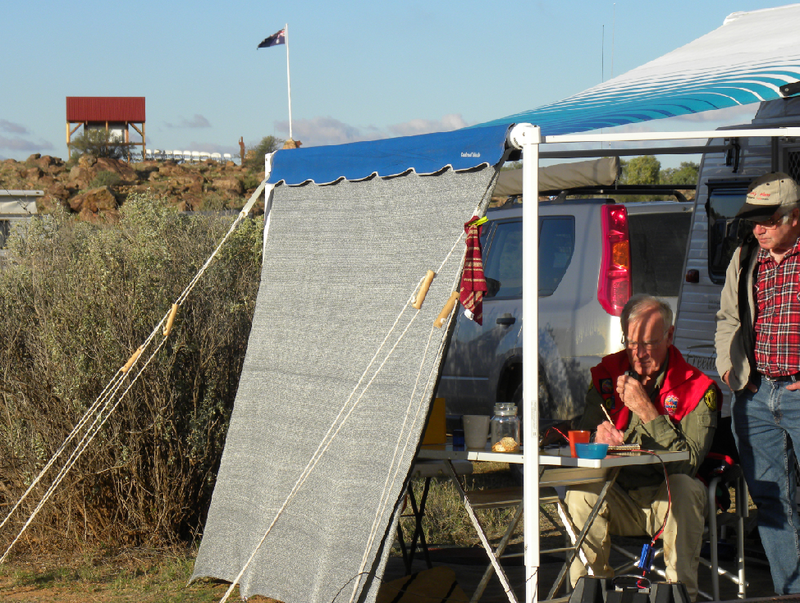 On the 20th June we travelled to the Flinders Ranges National Park, VKFF-176, where I made 32 contacts. I have now successfully activated this Park for the WWFF award. On the 20th June we visited Lake Torrens National Park, VKFF-278. This is a rare park from an amateur radio perspective, only having been activated twice before, by Larry, VK5LY and, later, Tony, VK3VTH/P5. On Friday 22nd June we re-visited the Argadells to activate Mount Arden, VK5/SE-034. The track had dried out and we were able to access the summit. While the weather was fine, the wind was gale force. Propagation was also poor. Seven contacts were made so the summit was successfully activated. On Monday morning, 22nd June, I returned to Mount Remarkable National Park, VKFF-360. I chose Willowie Forest and set up early evening and secured a further 21 contacts, making 34 in total for this Park. I will have to return in the future to gain another ten! My contribution to the qso total was over 200 contacts. This was well short of Paul’s contact numbers, but I tried different bands and enjoyed considerable success on thirty metres. I will say more about the contacts and bands used in each individual blog entry. It is sufficient to say here that we had a great time and the contacts, are as is usual, only possible as a result of the generous efforts of the chasers. Thanks to all.